Swine farming does require specific products and Ceva has the Cevolution anti-infective range of differentiated injectable antibiotics (fast syringeable and easy resuspendable formulations with innovative, practical, shock resistant, light and ergonomic CLAS® vials) that meet these needs. Vetrimoxin®L.A. an injectable suspension (long-action amoxicillin) for the treatment of diseases caused by susceptible organisms, and more particularly respiratory affecttions, neonatal diseases etc. Florkem® (Florfenicol): an injectable solution indicated for the treatment of swine respiratory disease caused by strains of Actinobacillus pleuropneumoniae and Pasteurella multocida. MarboxTM(Marbofloxacin): an injectable solution belonging to the fluoroquinolone family, with a broad spectrum activity against Gram (+) and Gram (-), indicated for Metritis, Mastitis, Agalactia Syndrome. Cevaxel®1G and 4G, Cevaxel ®-RTU (Ceftiofur): ian njectable Cephalosporin resistant to beta-lactamase active against Gram (+) and Gram (-), indicated for the treatment of bacterial respiratory disease in which Pasteurella multocida, Actinobacillus pleuropneumonia andStreptococcus suis are involved. Spirovet® (Spiramycin): an injectable solution of short acting macrolid, indicated for the treatment of mastitis as mainly active on Gram (+). Intramicine®: an injectable solution of benzylpenicillin procain and dihydrostreptomycin. Injectable Cephalosporin (ceftiofur) with bactericidal properties related to the inhibition of bacteria cell wall synthesis and active against Gram (+) and Gram (-), indicated for the treatment of bacterial respiratory disease in which Pasteurella multocida, Actinobacillus pleuropneumoniae and Streptococcus suis are involved. Cevaxel-RTU is an injectable suspension based on ceftiofur (third generation cephalosporin) with bactericidal properties, for the treatment of affections caused by susceptible organisms, and more particularly respiratory diseases in swine. Thanks Ceva’s expertise, Cevaxel-RTU formulation has been developed to easy injection and is presented in its specific CLAS® container, patented by CEVA Animal Health. Cevaxel-RTU is a unique product that provides at the same time efficiency as well as a good comfort for the pig and for the farmer. 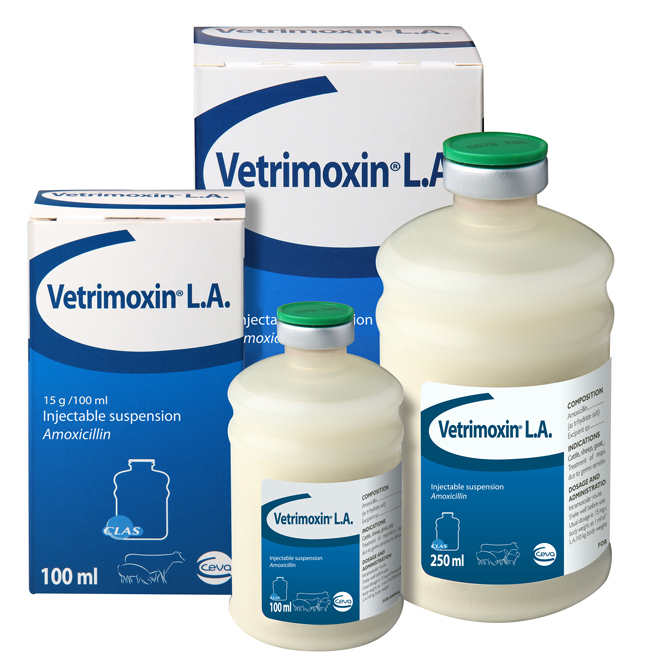 Florkem® (Florfenicol) is an injectable solution indicated for the treatment of swine respiratory disease caused by strains of Actinobacillus pleuropneumoniae and Pasteurella multocida. Florkem® has a specifically developed blend of adjuvants which significantly improves its syringeability, making administration simplier. The product is presented in its specific CLAS® container, patented by CEVA Animal Health, making it handy and more convenient to use. Intramicine® (Benzylpenicilline procaIne and Dihydrostreptomycine) is an injectable solution of a synergic association of two antibiotics which, thanks to the complementarity of their spectrum of activity, allows a bactericidal activity on various Gram-positive and Gram negative germs. MarboxTM (Marbofloxacin): injectable solution belonging to the fluoroquinolone family, with a broad spectrum of activity against Gram (+) and Gram (-), indicated for Metritis, Mastitis and Agalactia Syndrome. Presented in its specific CLAS® container patented by CEVA Animal Health, MARBOX® is a unique speciality that provides at the same time a fast action (a Cmax of 1,7 mg/ml, reached in one hour) efficiency, short withdrawal period (4 days withdrawal period), as well as a good comfort for the pig and for the farmer. Injectable short acting macrolid (Spiramicyn), indicated for the treatment of mastitis as mainly active on Gram (+). Spirovet® is presented in its specific CLAS® container, patented by CEVA Animal Health, SPIROVET® is a unique speciality that provides at the same time a quick efficiency as well as a good comfort for the pig and for the farmer.